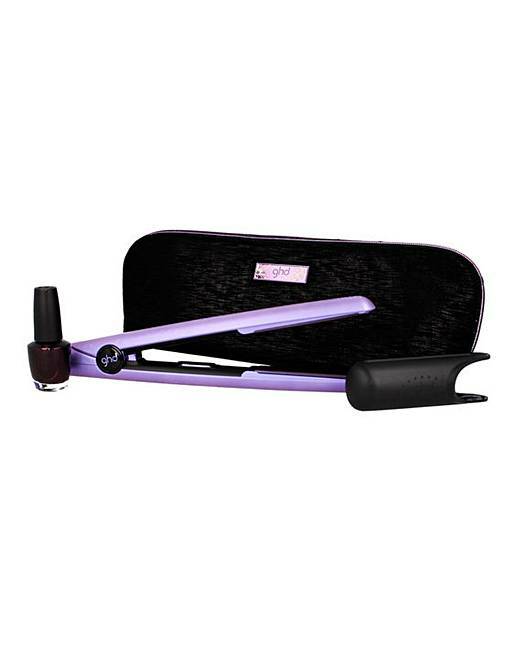 ghd V Nocturne Styler Premium Gift Set is rated 4.9 out of 5 by 16. Embrace the party season and create infinite styles with the ghd V® Nocturne Styler Gift Set, which is suitable for all hair types. Rated 5 out of 5 by Diane from Elegance style and great results I WAS impressed by the lovely roomy bag the straighteners came in and the deep mauve nail polish..that will go to my daughter. Within 10 seconds of turning it on..the plates were HOT! So take caution! The plates slid through my hair like a skier going down the ski slopes! My once thick hair went sleek and smooth..I was also impressed I didnt have to re-do all my hair for 2 days..just small parts. Usually I have to do the whole of my head every day! Which was drying my hair out no end! Its early days but Im very happy and pleased I treated myself! Rated 5 out of 5 by David from Perfect I bought these the wife as her old set are 10 years old,she was made up.. Rated 5 out of 5 by Woo from Fantastic straighteners These are great straighteners they glide through my thick hair with ease.